The hydraulic resistance was measured on internodal cells ofNitellopsis obtusa using the method of transcellular osmosis. The hydraulic resistance was approximately 2.65 pm−1 sec Pa, which corresponds to an osmotic permeability of 101.75 μm sec−1 (at 20°C).p-Chloromercuriphenyl sulfonic acid (pCMPS) (0.1–1mm, 60 min) reversibly increases the hydraulic resistance in a concentration-dependent manner.pCMPS does not have any effect on the cellular osmotic pressure.pCMPS increases the activation energy of water movement from 16.84 to 32.64 kJ mol−1, indicating that it inhibits water movement by modifying a low resistance pathway.pCMPS specifically increases the hydraulic resistance to exosmosis, but does not influence endosmosis. By contrast, nonyltriethylammonium (C9), a blocking agent of K+ channels, increases the hydraulic resistance to endosmosis, but does not affect that to exosmosis. 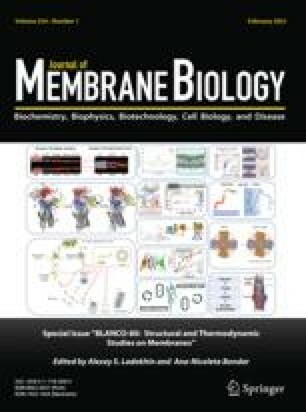 These data support the hypothesis that water moves through membrane proteins in characean internodal cells and further that the polarity of water movement may be a consequence of the differential gating of membrane proteins on the endo- and exoosmotic ends.